Creating a new garden starts by meeting you on site and listening to your needs and wishes. We walk your property, explore the conditions of the site, and generate ideas. We then provide you with recommendations, as well as show you pictures of our work. At this time, we’ll request a copy of the property survey, take digital photos of your property , and establish your wish list of needs, ideas, and desires. With this information, we’ll prepare and furnish you with a detailed written estimate for the entire project for your review. We can give you an estimate the same day of our meeting. 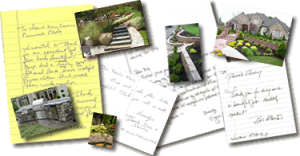 We believe that landscape design is as much a creative process as a scientific and technical one. It is the unique choice and placement of harmonious shapes, colors, forms, and textures within the setting that yield a successful landscape environment. Our design services begin by developing a custom conceptual plan that fits your personal tastes and lifestyle. We create an accurate, to scale base plan from your property survey. We then prepare preliminary design sketches of the areas you are interested in developing. After we go over the plan together to determine whether all of your needs have been met, we modify the concepts to produce a master plan. Once your project has been completed to your satisfaction, we then develop a unique program for maintenance and management for each individual property, taking into account local and seasonal factors, as well as your budget.